Maojie “Jeff” Xia, who’s visiting Santa Barbara during his winter break from the University of Montana, arrived at the Santa Barbara airport on New Year’s Day and went straight to the Santa Barbara Go Club at the Coffee Bean, where he played for three and a half hours non-stop with club members including Stephanie Ho and Melvin Rosenfeld, giving both six stones and winning by resignation. 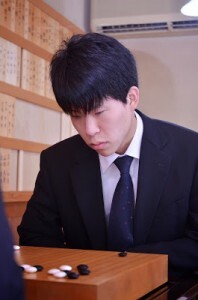 Xia returned to the club last Saturday for “Saturday Sasual Go”, this week held at the home of Goro Nakano, where he played a simul with three club members. Xia, an ex-insei who studied at Nie WeiPing’s Go school in Beijing, is currently studying accounting at the University of Montana. photo (l-r): Maojie “Jeff” Xia, Stephanie Ho (7 stones handi, B+2.5), Goro Nakano (7 stones handi, W+R), Melvin Rosenfeld (6 stones handi, W+R). Netherlands: Michiel Tel 5d (left) took the Heerlen NieuwJaars Go Toernooi on January 5. Behind him were Jonas Welticke 4d and Geert Groenen 6d. 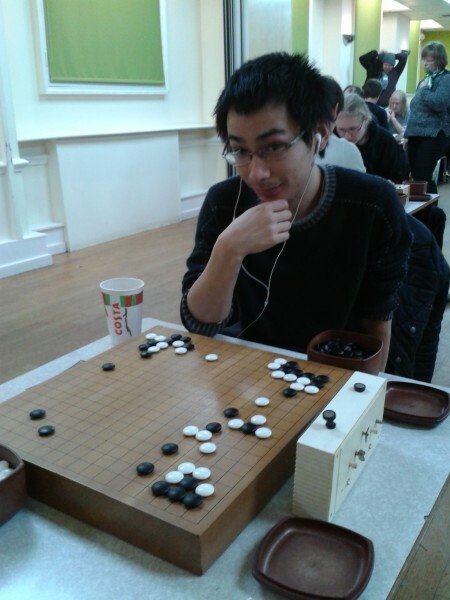 England: Yuanbo Zhang 4d bested Benjamin Drean-Guenaizia 5d at the London Open on December 31 while Pierre Paga 4d placed third. Finland: The Takapotku Open finished in Espoo on January 6 with Juri Kuronen 6d in first, Antti Tormanen 7d in second, and Vesa Laatikainen 5d in third. The 40th London Open Go Congress, the UK’s largest and oldest go event, took place December 28-31 at the International Student House in central London. 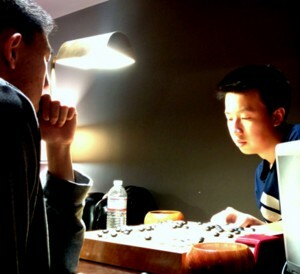 With a field of 109 players ranging from 5d to 24k, first place in the seven-round main tournament was taken by Zhang Yuanbo 4d (right), a Chinese graduate of the University of Nottingham, with six wins. French visitors Benjamin Drean-Guenaizia 5d and Pierre Paga 4d took second and third place with six and five wins respectively and Briton Andrew Simons 4d, also on five wins, came fourth. Games were 90 minutes main time (60 if both players 20k or weaker), with Canadian (repeating) overtime of 20/5 and tie-breaks decided on McMahon score. 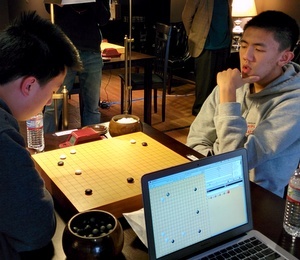 In fact, as our photo below shows, Zhang could have had a perfect 7/7 if he had noticed opponent Drean-Guenaizia’s flag fall during overtime in round six. However, his attention was entirely focused on the close battle on the board and he eventually decided the game was lost and resigned. Click here for full results. After 10-minute round-robin qualifiers, fellow Finns and good friends Mikko Suikola 4d and Janne Nikula 2d emerged from a knockout stage as finalists in the Lightning, held on Monday evening, December 30. The 12-minute final was rather informal, with beer on the table and good-natured banter passing between the competitors as they played, referee Jenny Radcliffe having to step in at one point to warn one of the many spectators not to comment on the position. Despite a stiff handicap of three stones, based on McMahon score after Nikula’s rather poor showing in the main, Suikola nevertheless prevailed to take first prize. In the Pair Go, an unfortunate paucity of female competitors meant there were a number of all-male teams admitted to balance the numbers and in fact no females figured in the top three (of 14) pairs, who were Boris Mitrivoc 2d and Fynn Bachmann 1k, Andre Stadtler 3d and Chris Volk 2k, and Andrew Russell 4k and Jonathan Green 5k, in that order. The tournament rule that a Pair Go team shall comprize “one lady and one man” was overcome by the forensic observation that the term “lady” was undefined. We spare the blushes of the nominal “ladies” by not specifying who was which. Click here for full results. 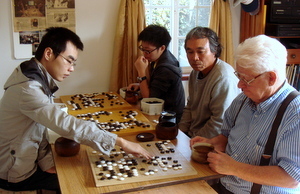 Top European-rated player, Korean Hwang In-seong 8d (right, at board facing camera) was present throughout, spending two-three hours per round reviewing games as well as giving a lecture on opening theory on Sunday 12/29 and one on local techniques Monday 12/30 and reviewing the top game on the teaching board on the Tuesday afternoon, 12/31. He told the E-Journal he had competed in the London Open in 2005 and was very happy to have been invited to teach there this year. 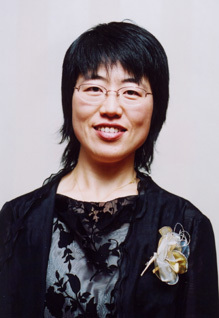 Guo Juan, who has for many years filled this role, was in Montreal this year and so unable to attend. There was also a new event on Monday 12/30, the first WBaduk Varsity Match, between teams from Oxford and Cambridge Universities which was drawn (see Oxford and Cambridge Battle to Draw in 1st WBaduk Varsity Match, EJ 1/1). After the prize-giving ceremony, proceedings ended with Rengo followed by a New Year’s Eve meal. 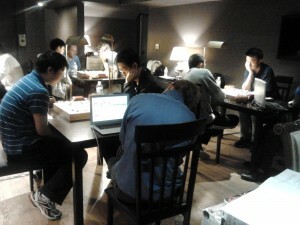 The Congress was organized by the British Go Association and the Central London Go Club, and also received support from the Nippon Club, the Anglo-Korean Society, WBaduk and others. Martha McGill was the main organizer, Jenny Radcliffe tournament director and organizer and referee for the Lightning and Rengo. Nick Wedd was the referee for the main tournament and organizer and referee for the Pair Go. Tony Atkins organized provision of equipment and David Cantrell ran the bookstall. Others too numerous to mention played smaller roles. Click here for further details in the British Go Association’s report. 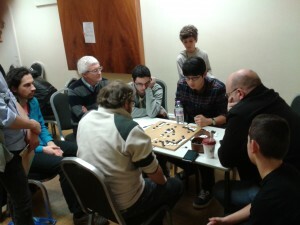 In other British go news Under-10 Champion Oscar Selby 7k (pictured above, looking over Hwang’s shoulder) took the 2013 Youth Grand Prix with 1411 points – more than twice those of his nearest rival, Edmund Smith 17k. Click here for full details. Tony Collman, British correspondent for the E-Journal. And then there were three. 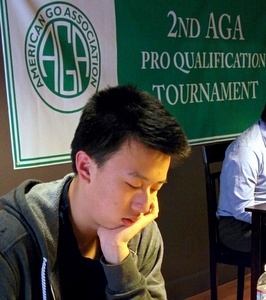 Calvin Sun, Jianing Gan and Bill Lin are the finalists to be the next U.S. professional go player. Sun and Gan play each other Sunday morning (the game will be broadcast live on KGS) to determine the top-bracket winner, who will then play bottom bracket winner Lin. Click here for pairings, results and game records. Promotional League Round Four results: Calvin Sun defeated Jianing Gan (top bracket); Bill Lin eliminated Andrew Lu (bottom bracket). Round Three results: Jianing Gan defeated Calvin Sun (top bracket); Bill Lin eliminated Ryan Li; Andrew Lu eliminated Eric Lui. Round Two results: Jianing Gan defeated Eric Lui (B+r); Calvin Sun beat Bill Lin (B+r); Ryan Li eliminated Daniel Gourdeau (B+r); Andrew Lu eliminated Ben Lockhart (W+2.5). Over 500 hundred fans watched online Friday morning as the opening round began for the second AGA Pro Qualification tournament. The games are being held at the historic Hotel Normandie in downtown Los Angeles, and broadcast online on KGS. Games began at 9:30 am (PST) Friday, January 3. Players who lose in the first round will still have a second chance to continue on into Round Two in this double elimination knockout event. Round Two started at 4:30 pm (PST) today (Jan. 3). Round 1 results: Eric Lui defeated Daniel Gourdeau (W+12.5); Jianing Gan defeated Ryan Li (W+r); Bill Lin defeated Ben Lockhart (W+14.5); Calvin Sun defeated Andrew Lu (B+1.5). 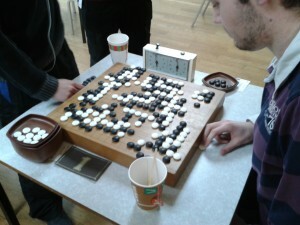 Before the games started, each player was given a portable go set from the Korea Baduk Association (KBA). The winner will not only be certified as the AGA’s third professional player, but will also win a $1,500 cash prize, and each finalist will receive $800. Jeff Shaevel is the tournament director, Myungwan Kim the referee, and the E-Journal’s game recording team includes Andrew Jackson, Richard Dolen, Dave Dows, Dennis Wheeler and Joe Cepiel. Also on hand are AGA president Andy Okun and Executive Vice President Ted Terpstra.